This morning I was up early and down at the Molly Malone statue before 8:00 for my tour of Newgrange, Monasterboice, the Hill of Tara, and the Hill of Slane. 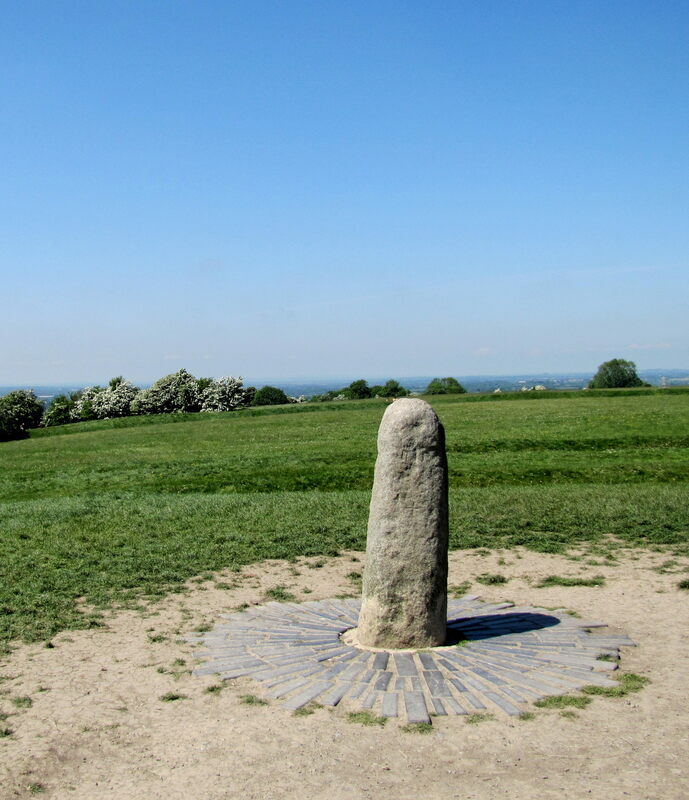 On my first trip to Ireland, I took a tour of Newgrange and the Hill of Tara that you can read about here, but this tour offered a few more stops, and the weather was much nicer this time. There were so many companies picking up tours at the statue that I thought for a while that I had missed mine, but our guide showed up right on time. Apparently, he had planned for earlier, but there was a real traffic tangle because of an accident on one of the Dublin ring roads. I am glad I hadn’t missed the tour. On my last trip to Ireland, I used the same company to take a tour to Trim Castle and Glendalough, and it was one of the best tours I’ve been on, thanks to the very excellent guide. I had booked this exact tour last trip, but it got canceled because of not enough people signing up for it. Anyway, off we went to Newgrange. 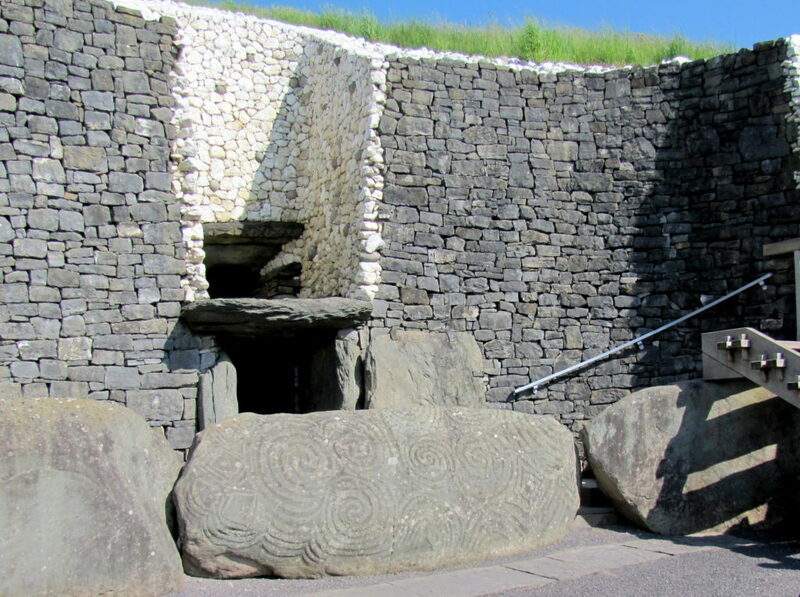 It was a bright, shiny day, and that made so much difference to the way Newgrange looked. The white facing of the wall practically glowed. 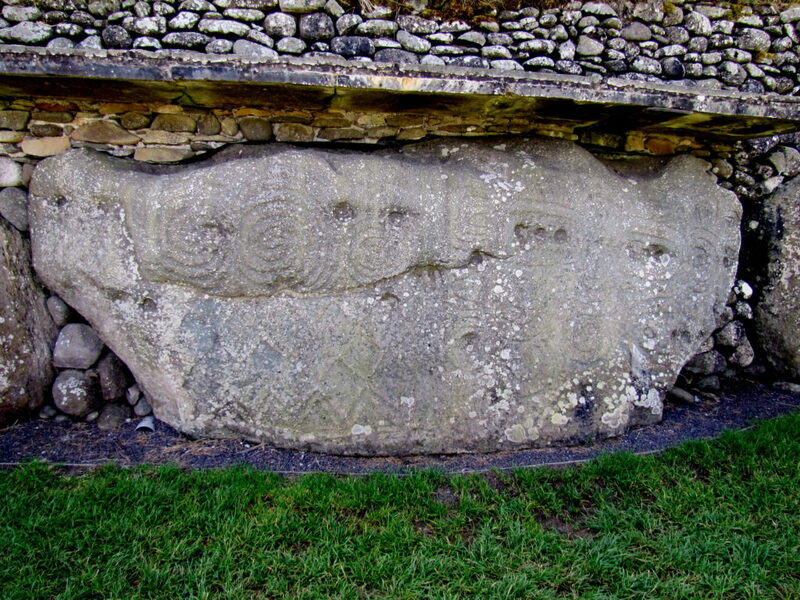 I still love the threshold stone at Newgrange, with the megalithic art on it, and the symbolism of having to climb over it to enter the underworld of the passage tomb. This is one of the 90-odd curb stones ringing the base of the Newgrange mound. I’ve tinkered with the contrast and stuff to try and bring out the patterns etched in the stone. Apparently, true megalithic inscriptions consist of these types of abstract, geometrical patterns. There’s lots of disagreement about what they actually mean. From Newgrange, we went to Monasterboice. I had heard about this place – a monastery that had faded when the Cistercian Order came to Ireland, and didn’t leave much in the way of records. Left a lot of high crosses in the graveyard, though. This is the tallest high cross in Ireland, at about 7m. The damage at the base was apparently done around the time of the famine, 1845-1850, as locals who were emigrating chipped bits off to take with them as they left home. Also, that’s one of the tallest round towers looming in behind it. 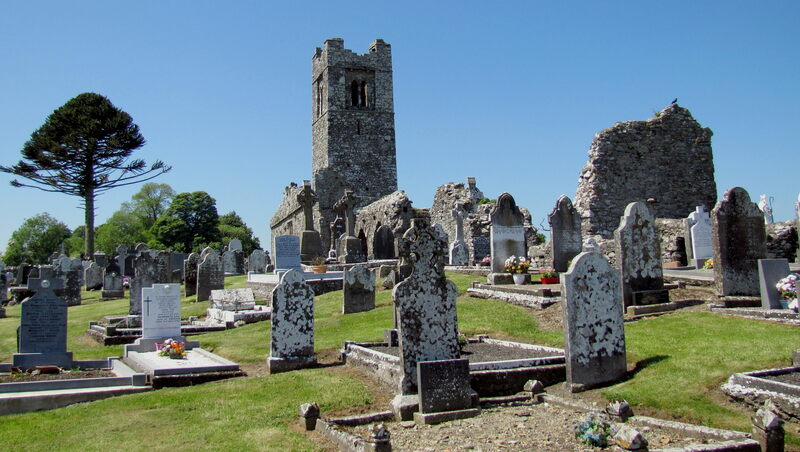 From Monasterboice, we went to the Hill of Slane. The Hill of Slane features the ruins of a Franciscan abbey and school. 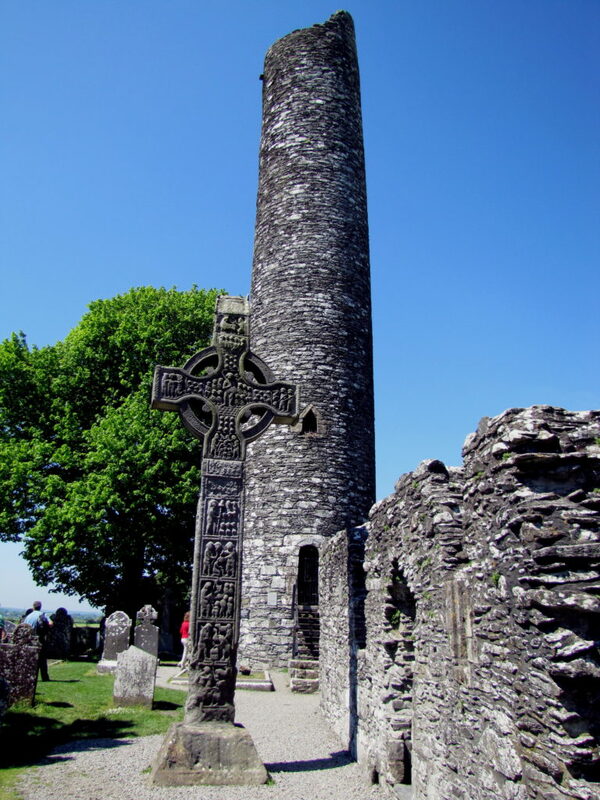 The story is that St. Patrick violated the rules of the High King at Tara by lighting a fire on Slane Hill on Beltane – Easter – to announce the arrival of Christianity. The King didn’t punish him, and allowed Patrick to begin his mission to convert the pagans to Christianity. Apparently, each Easter, the church re-enacts this, lighting a small fire on the Hill of Slane. I asked about whether or not they have someone watching for the fire over at the Hill of Tara, where the High King had seen Patrick’s fire, and was told that the fire is now to small. But, my guide said, several years ago, RTE1 conducted the experiment: they lit a large fire on the Hill of Slane, and apparently it could be seen very clearly from the Hill of Tara, 15km away. And the Hill of Tara was our next stop. This is the view down from the central mound of the Tara earthworks. You can see the rings of berms and ditches, and the outer ring way down near the flowering blackthorn trees. And, of course, the Lia Fail, the Stone of Destiny, which was used to crown the kings in ancient Ireland. 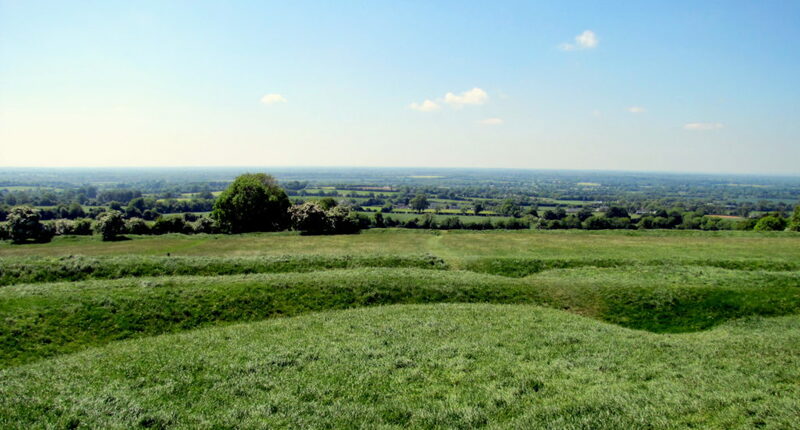 Apparently, it used to sit on the high point of the Hill of Tara, the passage tomb called the Mound of Hostages, but was moved here after the Battle of Tara in the 1798 rebellion. And then it was back to Dublin, back to the flat, and catching up on the blog. Tomorrow, I get on the hop-on-hop-off bus tour. One of the things I’m planning on seeing is Glasnevin Cemetery, which I haven’t visited before. I’m putting this in the Dublin category because that’s where I’m staying right now1, even though this post is not about Dublin really at all. Today’s agenda was my Mary Gibbons bus tour out to the Hill of Tara and Newgrange. On the drive out, Mary filled us in on the history of the Boyne Valley, the Battle of the Boyne, the importance of Tara to Irish History, and the significance and history of Newgrange and the other passage tombs in the area. It was an informative talk, and helped the time pass swiftly. She was also very good at pointing out interesting things that we passed, and giving us a bit of history on them. The Hill of Tara was our first stop. When we got there, Mary warned us that the wind was going to be fierce out on the hill, and that the ground was going to be slippery2, so we should think carefully about going down into the trenches or climbing the mounds. Enough exposition. Here are the pictures. The statue of St. Patrick by the path leading up to the Hill of Tara. The gate to the churchyard, through which you need to pass to get to the hill, is locked. You have to squeeze through a little notch at the top of some stairs in the churchyard wall. As you might be able to tell in this picture, it had started drizzling at this point. And the wind, which I had scoffed at in my mind, was getting stronger. My hat blew off at one point, and a pair of nice ladies walking their dogs had to help me catch it. Thanks, ladies! After that, I tied the cords under my chin no matter how stupid it made me look. The churchyard at Tara. You can see the Mound of the Hostages rising in the background. These are the sorts of trenches Mary warned us about. You can’t tell very well from the picture, but they are at least six feet deep, and some are easily fifteen feet deep, with steep, slick, grassy sides. Some perspective: this is the view of the top of the Hill of Tara from the foot of the hill. Note the two rings of trenches. Yeah, I totally ignored Mary’s advice about them. On top of the Hill of Tara. The stone to the right is the Lia Fail, the Stone of Kings. The stone to the left marks the grave of 400 Irishmen killed here in the 1798 rebellion. They say that from the top of Tara, on a clear day, you can see two-thirds of Ireland. Well, we didn’t have a clear day, but we could see a good long way. Easy to see why it was chosen to build the High King’s Fort – you can see any enemy coming for days. Then I made my way back down from the top, through the treacherously slippery trenches3, and went look at the Mound of Hostages. This is a smaller, less-elaborate version of what’s coming at Newgrange. It was closed to the public, so we could only look at it from outside. Looked like a tight crawl, anyway. The wind was blowing something fierce on top of the hill – there was nothing nearby to slow it down, so it basically got a running start right across the whole country and slammed into us up there. My hat was more like a kite from time to time; thankfully, I had tied the idiot strings under my chin to keep from losing it. It was also drizzling a fair bit of the time up there. And then it was back on the bus, and on to Newgrange, through Slane village, which was neat to see. We didn’t stop, but we got a look from the road at Slane Castle4, and the four big stone houses in the middle of the village that a man had built for his four daughters who couldn’t get along with each other. We also got a nice look at the actual site of the Battle of the Boyne, and a glimpse of Knowth Tomb on a hill near the river. Then we were at the Bru na Boinne Interpretative Centre, where we had a nice lunch, saw a little film about Newgrange and the thirty-nine other passage tombs in the Boyne Valley, and basically waited for the rain to get really ready to fall on us when the shuttle buses arrived to take us up to Newgrange itself. I don’t have as many pictures of Newgrange, for two reasons. First, they don’t allow photography inside the tomb itself. Second, as I think I mentioned, it really started raining while we were up there, and most of the pictures I took are useless because of water drops on the lens. Still, here are a few. A look up at Newgrange from the area where you wait for your guide. See the nice blue sky? It’s a filthy liar. Rain is falling. For purposes of preserving the site, visitors to Newgrange are limited. Here’s the whole crowd from our tour waiting for our guide to take us up. The tractor is just cutting the grass. An unexcavated (and smaller) passage tomb in a nearby field. One of the megaliths that surround Newgrange and dot the hills all throughout the area. The entry stone at Newgrange. Archaeologists think the original builders had those who wished to enter the tomb climb over the stone, letting it represent the barrier between life and death, between the physical and the spirit world. Fortunately, in modern times, we get to climb over on a stairway. Note the opening above the main opening – that’s for the sun’s light at Winter Solstice. Okay. The guide gave us a good buildup about how tiny and cramped it was going to be, and how the ceiling was low and it got so narrow at one point that they requested we take our backpack and bags off and carry them by hand to minimize scraping. She stressed that it was a pretty claustrophobic place, and that there was no way in or out except for the passage, and that almost a quarter of a million tonnes of rock was sitting over and around us. Well, as a hefty guy, let me tell you, it was tight. I got to one bit where I had to turn sidewise and sidle through, and thought, “Huh. That wasn’t so bad,” and then got to the actual tight spot. I had a moment there, as I was crouching and twisting, and almost crawling, where I thought I wasn’t going to make it. But I did. And man, was it worth it. The central chamber was pretty cramped with the twenty of us in it5, but it was very tall – six metres, according to the guide, with corbeled stonework rising up to a capstone far overhead. There were three nooks of the main chamber, each one with a basin stone that had once held cremated human remains. After a little bit of a talk about the place, and what it meant, the guide turned the lights off and, using electric light from outside, showed us what it looks like at Midwinter, when the light shines down the tunnel floor, which has risen to the same level as the light box above the entrance, and stabs one slender, perfect beam in to touch the basin stone in the end alcove. So. Out we come, and in goes the next gang, and it’s really raining pretty hard by this point. I walked around the tomb, but couldn’t get any more decent shots, though I really wanted to capture some of the decorated curbstones around the base of the mound. I gave up and went back down the hill to wait for the shuttle bus. And so we wait in the rain for another bus to come. After about fifteen minutes, the driver of the broken bus lets us wait inside the bus, out of the rain. And about fifteen minutes after that, the replacement bus shows up, but there’s so many people waiting for the bus now that I get to wait for the replacement replacement bus. And when we get back to the Interpretive Centre, the rain stops, and the world looks beautiful and green and amazing. See? Once we were done with being outside, it decided to play nice. So, that was Newgrange and the Hill of Tara. Wet, windy, cold, and absolutely worth every bit of it. Both sites were amazing, and the Mary Gibbons tour was an exceptionally good way to see them.